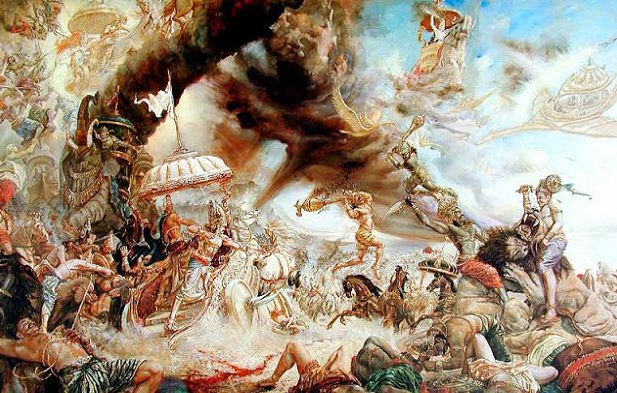 Arjuna returns from Indra’s palace in the heavens back to his brothers and his wife Draupadi in the Gandhamadan mountains. He tells them the stories of his conquests against the Nibata Kabacha demons and the demonesses Paulam and Kalaka’s army. Next we hear the fascinating story of how the mighty prince Bheema was about to be devoured by King Nahusha in the form of a giant snake. Nahusha asks Yudhistira, who is a true Brahmin? Only the right answer from Yudhistira would save Bheema’s life. Listen to the enchanting episode with flying airships, incredible weapons and deep philosophical thoughts by clicking the player below. And please don’t forget to share your thoughts.